"It is a dark day for the rule of law. Federal and state authorities have chosen not to indict HSBC, the London-based bank, on charges of vast and prolonged money laundering, for fear that criminal prosecution would topple the bank and, in the process, endanger the financial system. They also have not charged any top HSBC banker in the case, though it boggles the mind that a bank could launder money as HSBC did without anyone in a position of authority making culpable decisions. 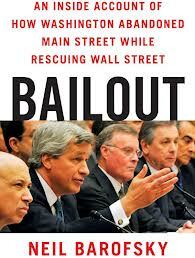 Clearly, the government has bought into the notion that too big to fail is too big to jail"